I’m now working on a 3-month contract in Central Manchester, as I was made redundant from my previous role in St Helens in January 2012. Setting up as a contractor for the first time has been a bit painful, and the travelling to and from Manchester isn’t ideal, but at least I have a job which is more than a lot of people have. We finally decided to let our rabbits go to another loving home. As their hutch was in the garden, we didn’t get to see them much, so they were always too timid to handle. The final push to let them go was the introduction of the newest member of our family – Crackers. 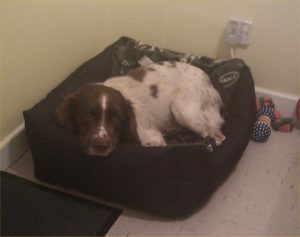 He is an English Springer Spaniel that we rescued from a local animal centre, and he’s a big softy. He hasn’t even barked yet, and he’s more likely to roll on his back and let you tickle his belly when you first meet him. The kids love him and he’s already coming out of his shell, and since we need to walk him several times a day, the extra exercise won’t do us any harm either! Previous: Blimey – that looks different !